Today I’ve got some news concerning old-school computer music to share with you. 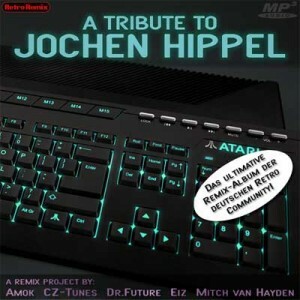 It turns out that a tribute to the legendary computer-musician Jochen Hippel has been released. It’s an album that contains ten .MP3 remixes of his most popular songs. It’s worth mentioning that this project was made with the consent of Jochen Hippel himself. The guys behind the album are Amok, CZ-Tunes, Dr. Future, Eiz and Mitch van Hayden. Have a nice weekend folks and happy gaming! Next Amiga Future: Now in Colour! Pretty cool. Downloaded the MP3 version of the album. That’s good to hear. Hope you enjoyed the music. 🙂 I love listening to retro-computer music myself, so I was very happy to get hold of the album. I am always nice to hear retro-bit music, especially Commodore and Amiga. I would greatly appreciate if you can tell from these gems more often.